Muzz has created the Pod which is a growing vase to hold air plants as well as fresh flowers. I love all the pockets integrating green life into sculpture. Originally designed for the "Plant for Art Exhibition" at Instanbul's Artane Gallery. Architectural planter systems can be a great way to divide small spaces, such as the Hydroponic Vertical Garden. For the constrained urban dweller who seeks a greener lifestyle, Danielle Trofe Design, a Brooklyn based design studio who takes a socially responsible approach to design developed a vertical garden for the person who doesn't have a green thumb......its self-watering system simplifies the process of growing your own plants inside your home. Its a simple system - It distributes water via an internal reservoir using an energy efficient air pump concealed within the structure and uses gravity to deliver water to each of the planter pods. Clay rocks are used instead of soil to eliminate any risk of soil-born disease. Brilliant! Guess what material these planters are made of? Did you guess mushrooms? 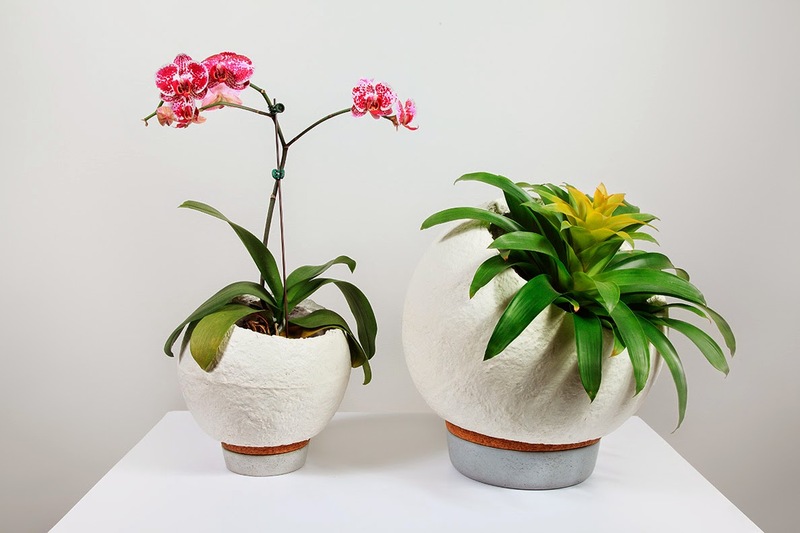 Yep, Danielle Trofe's Mush-Bloom planter is totally organic, sustainable and biodegradable! I really like the shape and texture of each mushroom vase, its charm would add style to your interior. What is so pleasing to the eye is a wall styled with plants. Woolly Pocket, a family owned company in the USA produces modular gardening pockets great for creating beautiful living walls in your home or backyard. 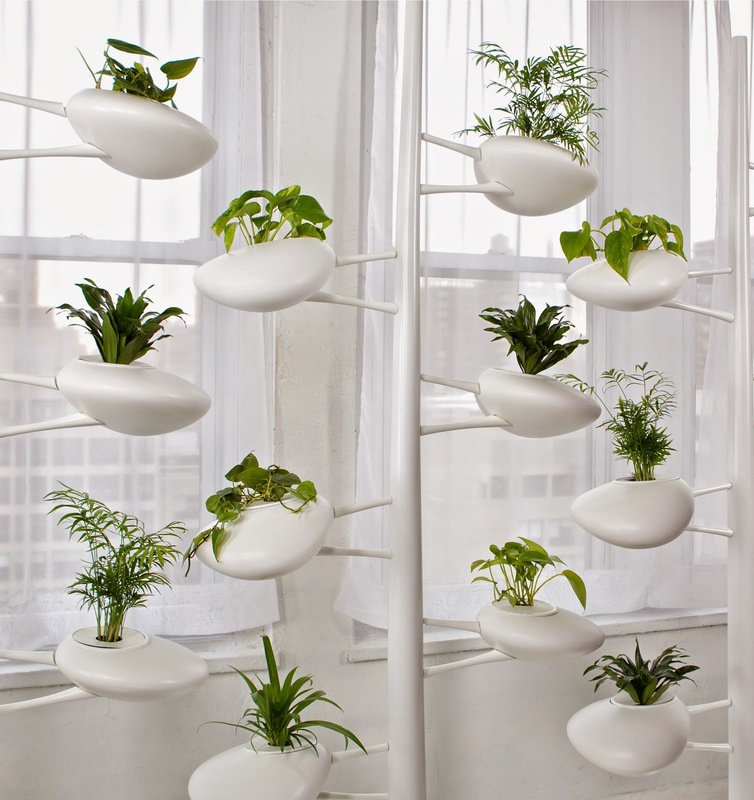 The product ultimately produces artfully suspended plant systems. There are two types of living wall planters. There is the sturdy hard vented shell that is equipped with a self watering tank. The other is a Wally made from 100% recycled plastic water bottles, where pockets are soft sided and breathable. The pocket science starts with breathable felt allowing oxygen to get into the roots and extra moisture to evaporate. Inside every pocket is a military grade totally impermeable moisture barrier keeping your walls and furniture safe. That's so key and perfect for an interior space!! The idea of combining plant material and lighting was one object that I was mesmerized by at the imm Cologne trade show in Germany. Designer Miriam Aust developed the Vase & Leuchte plant light, produced and distributed by the Dua Shop. With laboratory aesthetics brought into the home, the designer investigates how a plant can be influenced. I was really blown away by its lighting effects. The incredible light refraction and shadows cast from the hand blown glass and through the roots are very beautiful. Plants integrated with Furniture Design. Born in a small, lush village in the Rhone-Alpes region outside Paris, designer Pual Bellila needed to to escape the complex city world, and integrate nature into his dynamic environment. Out of his desire to bring harmony and freshness to his space, he created the unique Volcane coffee table and console collection. Its ceramic vase sculpturally houses plants, flowers or small trees like a bonsai. The trees add softness to each piece of furniture. Who needs a bulky vase when you can merge nature right inside your table. Brooklyn based designer Emily Wettstein designed an unique walnut Planter table which integrates plant material via an acrylic vessel which is attached at the underside of the table. I can imagine a wonderful abundance of apples, pumpkins or limes in this curvaceous slot for parties and holiday gatherings. 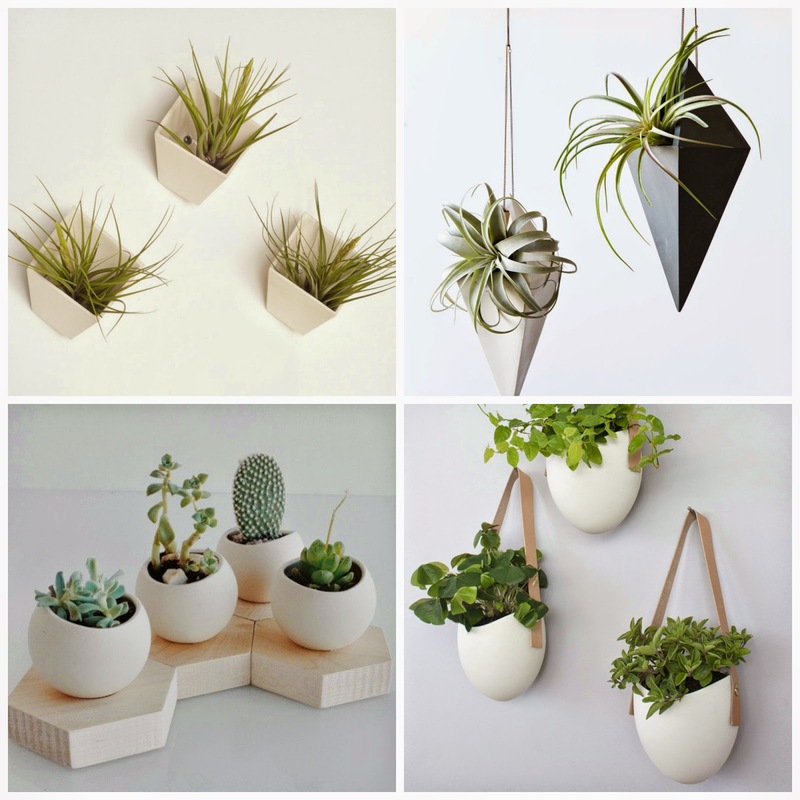 The Light + Ladder company creates modern and sculptural ways to decorate with plants. 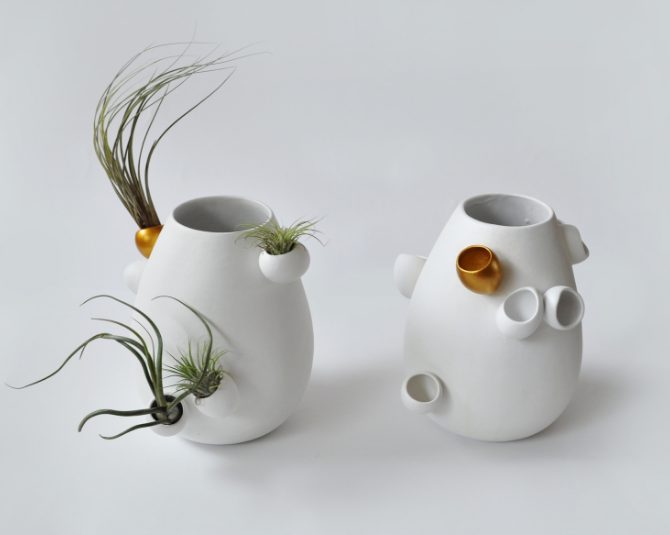 Imagine air plants in ceramic orbs called Spora or pyramidal ceramic sculptures called Ballast. You can hang them or display or on your table top. A grid of the Hive planters is art in itself. Perfect for miniature plants are the Hex Spora, organic shaped ceramic cups that rests on solid maple hexagonal coasters. So fun! Have fun creating instantly lush texture with plants in your spaces! You will feel instant gratification of warmth, wellness and style when you introduce plants!